Western blotting analysis of apoptosis allows for the detection, localization and quantification of proteins involved in apoptotic signaling. There are many proteins whose change in expression or localization is indicative of a particular point in the apoptotic process. Post translational modifications (PTMs) such as phosphorylation are also common events within apoptotic signaling. Western blotting allows for the detection of proteins (and their PTMs) with far greater versatility and specificity than other antibody based techniques. Here we offer advice and information on analyzing apoptosis by western blotting. We have included some general considerations on western blotting and detailed information on how western blot can be used to analyze the various stages of apoptosis. The main markers of apoptosis detectible by western blot include phosphorylated B-cell lymphoma 2 (Bcl-2) family members, activated fragments of caspases and cleaved poly (ADP-ribose) polymerase-1 (PARP-1). Apoptosis relies on the formation of a number of protein complexes (such as the apoptosome and the death induced signaling complex (DISC) amongst others). Therefore in addition to basic western blotting, immunoprecipitation (IP) is also a highly useful technique for detecting proteins contained within a complex. For IP specific products, protocols, tips and tricks, refer to our immunoprecipitation application page. The choice of target proteins will depend on the particular area of apoptosis you wish to study. When preparing for western blot, there are several factors about your target protein to be aware of, including the localization of your protein, the molecular weight and its level of expression. This information will help when interpreting the results. Detecting a band of an appropriate molecular weight is the first step in a successful and verified western blot. 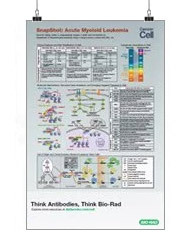 Bio-Rad provides highly specific validated antibodies. However the antibody will need to be validated in your particular experimental conditions. This validation may take several forms including verification with a second antibody, target protein knock out/knock down studies or demonstrating a well-known change in expression following a particular experimental treatment. As in any apoptosis assay it is important to ensure appropriate controls are included. When working with a cell line, any treatment that has been applied must be compared to an appropriate untreated set of cells. In the case of diseased or cancerous tissue, a healthy or benign sample should be used for comparison. This will allow for appropriate comparison of the expression of proteins involved in apoptotic signaling. When lysing tissues or cells, you should prepare samples containing similar total protein concentrations as determined by a protein assay kit. This will make western blot relative quantitation easier and give a more reliable indication of the change in the target proteins expression during apoptosis. Traditionally this relative quantitation between two samples has relied on comparing the expression of a house-keeping protein to your protein of interest. However this process can often be over a narrow linear range. Bio-Rad’s Stain-Free Technology offers a total protein normalization that functions over a wider range of detection and is more sensitive and accurate than traditional house-keeping protein methods. Knowing the subcellular localization of your target protein is crucial as it may influence sample preparation. For example detecting nuclear proteins such as transcription factors can be significantly enhanced by using a specialized ReadyPrep™ Protein Extraction Kit. Phosphorylation is crucial to almost all cell signaling pathways including apoptotic signaling. When detecting the phosphorylation of a target protein by western blot it is crucial to prepare your samples on ice with the appropriate lysis buffer containing fresh phosphatase inhibitors. For more information on sample preparation view the western blot sample preparation page. Choosing between a monoclonal or polyclonal antibody is an important step in antibody selection. A polyclonal antibody may provide a greater signal than a monoclonal as a result of binding to multiple epitopes. However polyclonal antibodies tend to produce a greater degree of non-specific binding than monoclonal antibodies. For western blotting, you also need a secondary antibody for detection. There are important considerations when selecting a secondary antibody. Bio-Rad offers a fluorescent western blotting platform with multi-parameter measurement capability which increases the suitability of western blot for studying apoptotic signaling pathways. It enables the simultaneous analysis of multiple proteins in a single sample on the same blot which reduces variation between blots. When combined with the greater consistency of readout using fluorescent dyes it increases the quantitative power of western blot. This new approach to western blotting will allow researchers to detect the subtle apoptotic events with greater accuracy while using as little of your rare/precious sample as possible. The nature of the sample should also be taken into account when selecting a secondary antibody. If working with cell/tissue lysate, which contains denatured IgG, it is possible that conventional secondary antibodies may bind to this IgG. This would lead to a western blot with excess non-specific bands which may mask the band of the target protein. TidyBlot™ Western Blot Detection Reagent (STAR209P) specifically binds to native (non-reduced) antibodies. Therefore it enables the detection of immunoblotted target protein bands, without the interference from denatured IgG. With these considerations in mind we will now examine how the four phases of apoptosis can be analyzed by western blot. The induction phase of the extrinsic apoptosis pathway involves binding of ligands to a variety of so called “death receptors”. Immune cells (i.e., cytotoxic killer and natural killer cells) use the activation of death receptors as one mechanism to attack cancer cells or virus-infected cells. Therefore uncovering the downstream signaling events that take place provides opportunities for developing new cancer therapeutics. Western blotting is a suitable method for deciphering the structure of intracellular signaling pathways. Table1 lists WB validated antibodies against the “death receptors”. Table 1. Western blot validated antibodies against receptors of the induction phase of the extrinsic pathway. Soluble CD95 (sCD95) is a decoy receptor which has the ability to inhibit apoptosis by neutralizing CD95 ligand. Abbreviations: FAS, Fas cell surface death receptor; FasL, Fas ligand; TRAIL, TNF-related apoptosis-inducing ligand; TNF-R2, tumor necrosis factor receptor 2; DR4, death receptor 4; DR5, death receptor 5. The induction of the intrinsic pathway is more difficult to measure since the initial steps may depend on the individual apoptotic stimulus. Damage to DNA or other critical molecules is a conserved initial event which is then propagated by one of several cellular stress response pathways. The early phase of apoptosis involves the signaling pathways activated downstream of the death receptors and the interactions of the Bcl-2 family members. The early phase of intrinsic apoptosis can be investigated extensively by western blotting. Most work up to this point has focused on examination of the expression and phosphorylation status of members of the Bcl-2 protein family. Analysis of Bcl-2 by western blot is particularly relevant in cancer research. For example overexpression of Bcl-2 and the proto-oncogene myc may produce aggressive B-cell malignancies including lymphoma. Furthermore detection of the phosphorylation of B-cell lymphoma-extra large (Bcl-xL) at serine residue 62 is indicative of activation of the intrinsic apoptotic pathway. This phosphorylation of Bcl-xL represents a potential read-out demonstrating early activation of the intrinsic apoptotic pathway. Table 2 lists the antibodies against Bcl-2 family members which have been validated in western blotting. Table 2. Western blotting validated antibodies against members of the early phase of the intrinsic pathway. Abbreviations: Bcl-2, B-cell lymphoma 2; Bcl-xL, B-cell lymphoma-extra large; BID, BH3 interacting-domain death agonist; BAX, Bcl-2-associated X protein; BAD, Bcl-2-associated death promoter; NOXA, phorbol-12-myristate-13-acetate-induced protein 1; PUMA, p53 upregulated modulator of apoptosis. Analysis of the early phase of extrinsic apoptosis pathway by western blot involves analysis of the signaling pathways downstream of the death receptors. These signaling pathways have been shown to be dysregulated in certain forms of cancer including head and neck squamous cell carcinoma and non-small cell lung cancer. Western blotting is capable of detecting the signaling molecules that interact downstream of death receptors, which are indicative of activation of the extrinsic signaling pathways. In particular, detection of the smaller active fragments of caspase-8 may be a definitive method for differentiating between extrinsic and intrinsic activation of apoptosis. Table 3 lists western blotting validated antibodies against members of the early phase of the extrinsic pathway. Table 3. Western blotting validated antibodies against members of the early phase of the extrinsic pathway. Abbreviations: RIPK3, receptor-interacting serine/threonine-protein kinase 3; RIPK1, receptor-interacting serine/threonine-protein kinase 1; FADD, Fas-associated protein with death domain. The mid phase of apoptosis sees the breakdown of the mitochondrial membrane, apoptosome assembly and activation of caspase-9, caspase-3 and caspase-7. The activation of effector caspases (caspase-3 and caspase-7) is a point of convergence of extrinsic and intrinsic apoptosis pathways. Detecting the smaller fragments of caspases following their activation is one of the more common methods to confirm apoptotic signaling. Here we will describe how to detect members of the apoptosome and activation of caspase-9, caspase-3 and caspase-7 by western blotting. Assembly of the apoptosome is provoked by the release of cytochrome c from the mitochondrial intermembrane space, an event that is both positively and negatively regulated by different members of the Bcl-2 family. To explore the protein composition of native apoptosomes, researchers can use a one-step immunoprecipitation approach to isolate active cytochrome c/caspase-9/Apaf-1 apoptosomes. For immunoprecipitation of apoptosome complexes, Bio-Rad recommends the Cytochrome c Antibody AHP2302 shown in Table 4. Table 4. Western blotting validated antibodies against members of the mid phase of the intrinsic pathway. Detection of cleaved caspase-9 by western blotting is evidence of activation of caspase-9 (Figure 1). Caspase-9 activation is a key point in the intrinsic apoptosis pathway and is reliant on other major pathways events such as loss of mitochondrial membrane integrity and formation of the apoptosome. Figure 1 and Table 5 show a pair of anti caspase-9 antibodies used to demonstrate the observable change in molecular weight following activation (cleavage) of caspase-9. Fig. 1. Active caspase-9 detection by western blotting. A, western blot analysis of whole cell lysate from HeLa cells probed with Rabbit Anti-Human Caspase-9 (AHP491). Rabbit Anti-Human Caspase-9 detects a band of approximately 46 kDa. 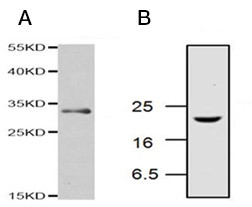 B, western blot analysis of untreated (lane 1) and etoposide-treated (lane 2) cells probed with Rabbit Anti–Caspase-9 (active) Antibody (AHP2288), which detects a band of approximately 37 kDa during mid stage of apoptosis. Table 5. Western blotting validated antibodies against caspase-9. Analysis of the middle phase of extrinsic apoptosis by western blotting can be achieved by detection of the effector caspase-3 and caspase-7 and in particular the active forms of caspase-3 and caspase-7. Caspase-3 is cleaved from an inactive 32 kDa pro-enzyme into p17 and p12 subunits by the activated initiator caspases-9 and 8 in apoptotic cells (Figure 2). Caspase-7 undergoes proteolytic cleavage of its precursor to form active p12 and p20 subunits (Figure 3). Antibodies specific for the activated cleaved forms of caspases are used to confirm activation of pro-apoptotic signaling pathways. Table 6 lists western blot validated antibodies against full length and cleaved activated forms of caspase-3 and caspase-7. Table 6. 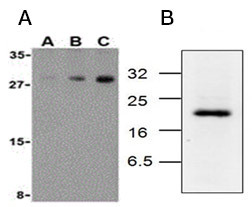 Western blot validated antibodies against members of the mid phase of the extrinsic pathway. Fig. 2. Active caspase-3 detection by western blotting. A, Rabbit Anti-Caspase-3 Antibody detects a band of approximately 32 kDa in Jurkat cell lysate under reducing conditions (AHP2717). B, western blotting analysis of Jurkat cell lysates, from cells treated with camptothecin, probed with Rabbit Anti-Caspase-3 (active) Antibody (AHP2286), which detects a band of approximately 17 kDa. Fig. 3. Active caspase-7 detection by western blotting. 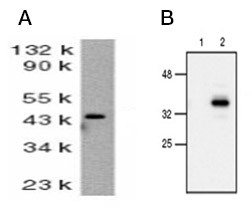 A, western blot analysis of human skeletal muscle probed with Rabbit Anti-Human Caspase-7 (AHP966) at 0.5 µg/ml (A), 1 µg/ml (B) and 2 µg/ml (C). Rabbit Anti-Human Caspase-7 detects a band of approximately 30 kDa. B, western blotting analysis of Jurkat cell lysates, from cells treated with camptothecin for 6 hr, probed with Rabbit Anti-Caspase-7 (active) Antibody (AHP2287), which detects a band of approximately 20 kDa. The late phase of apoptosis is characterized by significant morphological changes including cell shrinkage and membrane blebbing as well as fragmentation of DNA. Analysis of the late phase of intrinsic apoptosis by western blotting involves detecting key signaling proteins that are responsible for the significant morphological changes. The primary effectors of late stage apoptosis include Rho-associated protein kinase (ROCK), DFF40 (caspase activated DNase (CAD)) and DFF45 (inhibitor of caspase activated DNase (ICAD)). DNA fragmentation factor (DFF) is a heterodimeric protein of 40 kDa and 45 kDa subunits. DFF45 is a substrate for caspase-3 and triggers DNA fragmentation during apoptosis. DFF40 becomes activated when DFF45 is cleaved by caspase-3. Detection of cleaved fragments of DFF45 is indicative of activation of DFF40 and the final stages apoptosis. PARP-1 is a 116 kDa nuclear poly (ADP-ribose) polymerase which is involved in DNA repair in response to environmental stress. During apoptotic signaling, PARP-1 is cleaved by caspase-3 inactivating its DNA repair ability and creating two smaller fragments of 89 and 24 kDa. Detection of cleaved PARP-1 is a recognized marker of apoptotic signaling. Table 7 lists western blot validated antibodies against effectors of late stage apoptotic events. Table 7. Western blotting validated antibodies against members of the late phase of the apoptosis pathway. DNA fragmentation factor (DFF) is a heterodimeric protein of 40 kDa (DFF-40) and 45 kDa (DFF-45) subunits. During apoptosis caspase-3 cleaves DFF into the DFF-45 and DFF-40 fragments. Molecular weight of 116 kDa. Cleaved into 24 kDa and 89 kDa. MCA1522G detects both full length PARP-1 and the 89 kDa cleaved fragment. Abbreviations: CAD, caspase activated DNase; DFF, DNA fragmentation factor; DFFA, DNA fragmentation factor subunit alpha; DFFB, DNA fragmentation factor subunit beta; ICAD, inhibitor of caspase activated DNase; PARP-1, poly (ADP-ribose) polymerase-1; ROCK, Rho-associated protein kinase. The number of proteins involved in apoptosis is too large to review entirely. If you cannot find your target protein of interest, use our search tool at the top of the page. For more information on apoptosis or western blotting, refer to links to other resources below. If you are working with other applications, you may be interested in our dedicated pages on studying apoptosis by imaging or flow cytometry as well as overviews of the induction, early, mid and late phases of apoptosis.